I am a long way away from having to worry about fussy eaters. James, who is now 25 has developed an amazing palate and has become an adventurous eater and Mark who is 23 is still stuck in teenage boy feeder mode. I used to disguise vegetables in their food by grating them up finely and hid the fact that I cooked with pepper. Thankfully, I never had to worry about school lunches as I would not have known how to get the boys to eat all the ‘healthy’ stuff. 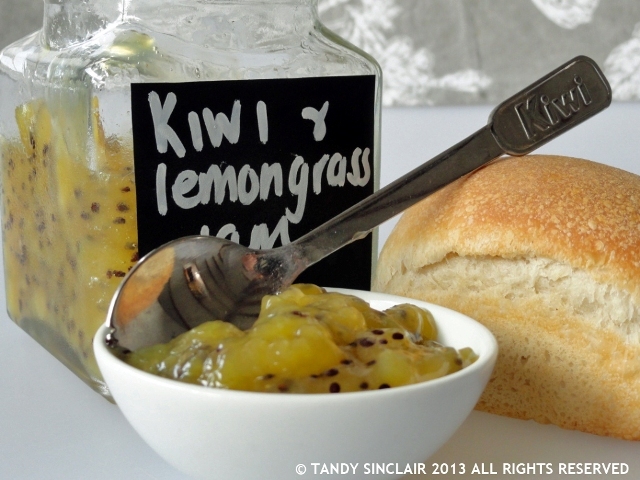 But, I have a lot of friends whose children are still of school going age and I am going to help them by sharing this kiwi and lemongrass jam recipe. Sandwiches are still a school lunch staple and I am sure they can be found in most children’s lunchboxes. When I was at school I got a brown bread sandwich with peanut butter and apricot jam. I think jam makes a great bread topping, and as this jam is so good for you, you could even pop a spoonful into some plain yoghurt to make it have a great depth of flavour. Do you still have school going children, and what do you pop into their lunchboxes? It is that good AD! OOOh yes! I made it today & all of the Yummy flavours go so,well together, my dear friend! TONIGHT, I will make the kiwi bellini! Lovely and unusual jam and it looks so vibrant! This is such a unique jam! I am so intrigued, I would love to try some of this! I love the European tradition of kids coming home at lunch time! And the nice thing is it is so easy to make! Lemon grass grows well here and I never know exactly how to use it. Jam is a terrific idea. My boys take PBJs daily and I hope other readers will give me additional ideas. I love using lemongrass so I shall think of a few recipes for you! I don’t think I’ve ever seen kiwi jam before! What a fun twist!